The Satellite Tokamak Program, JT-60SA, is a major modification of the existing JT-60U tokamak at the Naka Fusion Institute in Japan. 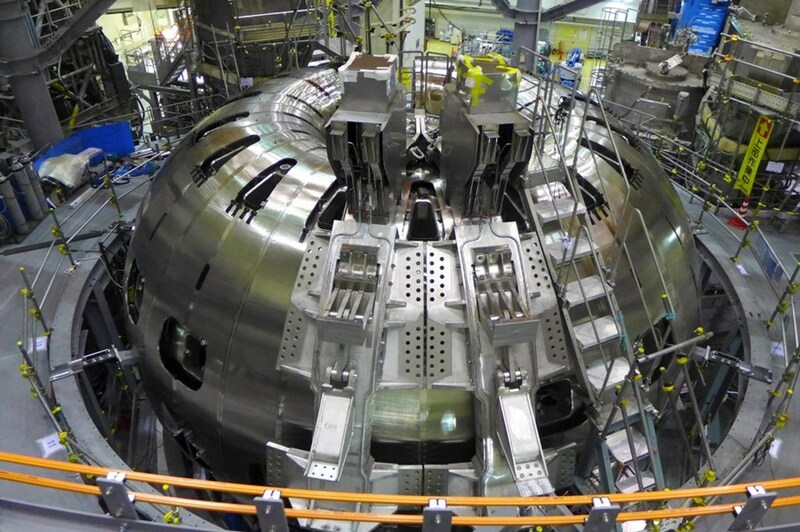 The first two of eighteen toroidal field magnets have been positioned in the machine. At a ceremony in mid-January, project stakeholders celebrated the ongoing collaboration between the European Domestic Agency and QST as well as voluntary contributions from European organizations CEA (France), ENEA and Consorzio RFX (Italy), CIEMAT (Spain) and KIT (Germany). Part of the Broader Approach Agreement signed between Japan and Euratom (and implemented by QST Japan and the European Domestic Agency for ITER), it is designed to support the operation of ITER and to investigate how best to optimize the design and operation of fusion power plants built after ITER. When it comes on line in 2019 after a six-year assembly and commissioning period, the JT-60SA research program will investigate critical areas of plasma physics, fusion engineering and theoretical models and simulation codes. These include the development of optimized operational regimes; questions of stability and control, transport and confinement, and high-energy particle behaviour; pedestal and edge physics; plasma-material interaction; fusion engineering; and theoretical models and simulation codes. In recent assembly news, the first two D-shaped toroidal field magnets have been successfully positioned around the machine's torus. Commissioning of the JT-60SA cryoplant has also been brought to a successful completion and ownership transferred from the European Domestic Agency to QST. Over the next three years the cryogenic plant will be progressively integrated with the cryodistribution and magnet systems. See the full report published on the European Domestic Agency website.